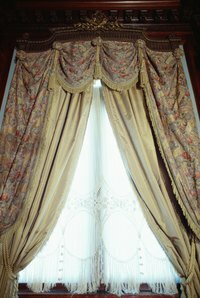 Curtains block sunlight while providing your home with an added level of privacy. Both functions are hindered, however, if the curtains don’t close completely. Prevent this by putting magnetic closures in both curtain panels to help the panels stay shut. Purchase sewing magnets from a craft or fabric store. These magnets have holes on the corners or inside the magnet that allow you to sew them into fabric. Round magnets have holes in the center for ease in sewing projects. Remove your curtains from the curtain rod. Make a mark halfway up the curtains along the inside edge of the panel with a fabric marker. The mark should be on the same location on the inside edge of each panel. Thread a needle and tie a knot on the end of the thread. Use thread that is the same color as your curtain. Place the magnet above the mark and hold it in place. The magnet should be on the inside of the curtain so that it is not visible from the room. Sew the magnet to the curtain by sewing one corner of the magnet to the curtain. Push the thread through the hole on the magnet and the fabric several times. Continue with the rest of the corners. Repeat the process with the other magnet on the other curtain panel. Repeat the process ¼ and ¾ of the way up the inside of the curtain panels so that there are three sets of magnets holding the curtain panels together. Put the curtains on the rod.